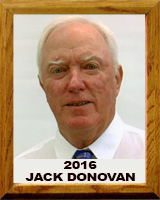 During the six years Jack Donovan headed up the Tucson Toros, he was named Executive of the Year in both 1979 and 1890. He saw early signs of extraordinary growth in owning Minor League teams. Over the next few years, he purchased Minor League teams in Salinas, CA, Spokane, WA and Salt Lake City, UT. At the same time, Donovan became the GM of the Las Vegas Silverstreaks of the World Basketball League, winning the championship in the league’s inaugural year. Another opportunity arose in Arizona’s Cactus League. While operating the Seattle Mariners Spring Training site, he started a Spring Training novelty company. The dealings of these various businesses kept him heavily involved in baseball for the next twenty three years. In 1999, Donovan was asked to operate the PCL’s Tucson Sidewinders. This eventually lead to the Arizona Diamondbacks and the Chicago White Sox requesting his services to oversee their Spring Training operations at Tucson Electric Park. Four years later, and after two World Series Championships (Diamondbacks in ’01 and White Sox in ’05), Donovan got back into ownership. Along with fellow investment partners, he purchased the Portland Winterhawks hockey team. After three years as CEO/President and rebuilding the franchise, the investment partnership decided to sell, and he moved back to Tucson. Upon his return to what Donovan considers his hometown, he was asked to help Pima County and their Sports Authority to keep Spring Training alive in Pima County. He has also served as the Senior Advisor to the PCL’s Tucson Padres the AAA Affiliate of the San Diego Padres. Donovan, along with Mike Feder and Francisco Gamez developed the Mexican Baseball Fiesta. The MBF quadrupled in attendance the first three years. Donovan lives in Tucson with his wife of forty years, Connie. Their daughter Erin lives in Maine with their three grand children, Greg III, Eve and Liv. Their son Shaun is currently serving on active duty in the United States Navy Special Forces.